Scheme to hunt Scottish Loch Ness monster down and mount beast's body in London makes headline news in official organ of St Petersburg government, Nick Holdsworth dips into this and other tales of British barking madness as filtered through a Russian lens. 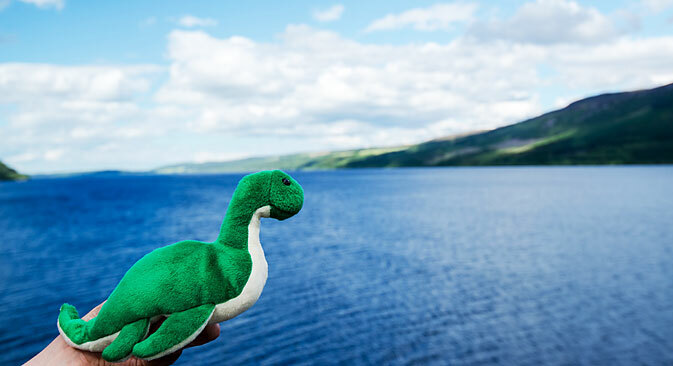 Loch Ness and its famous monster 'Nessie' have long exerted a fascination far beyond the rugged coastline of the British Isles. So when long forgotten plans to mount an expedition to hunt the beast down and display its body to a gawping public in London surfaced recently it is hardly surprising that it made headlines at home and abroad. What is somewhat unusual is where in Russia that story found a berth: in the august pages of Peterburgskii Dvenik, the official daily newspaper of St Petersburg's city government. The story ran under a logo for the newspaper's 'progress' section, accompanied by a black and white photo taken decades ago that is probably the most famous image of the creature: aquiline neck sitting sleeking above the black waters of the loch, a small reptilian head above it. The headline was sober enough: 'England planned to kill the Loch Ness monster and deliver its carcass to London'. In four short paragraphs the newspaper related the facts: a nefarious British plan hatched in the 1930s to find and shoot Nessie and put her stuffed body on display in London. The secret plan was uncovered during research for a new book, the paper explained, not neglecting to make it clear to readers possibly unfamiliar with the nuances of British eccentricity that Nessie is "the monster from Loch Ness in Scotland." But then there is this, the third sentence of the story: "The English wanted to deprive the Scots of their national heritage." Aha! For the Peterburgskii Dvenik this is not some dusty old and obscure story unearthed by a researcher sifting through long forgotten museum papers, but a political scandal that is bang up to date. The Scots may have narrowly voted just six weeks ago to stay in the 300 year old union with England, but that does not mean that all is well in the United Kingdom. Russia does not lack for its own stories of mysterious lake beasts. Take the legends of Siberian Lake Labynkyr. A major scientific expedition there last winter plumbed the depths trying to verify stories that have dogged scientists since the 19th century of 'devils' in the waters. Alas, all the expedition could come up with were photographs of larger than normal dogfish and jaws and skeleton of "some animal" as the Siberian Times reported last April. The Russian press also last week picked up on a couple of stories that are bread and butter of British tabloid journalism. In a country where the mail order bride was invented, a story about an English girl's lack of luck in love readily caught the imagination of news editors. Vesti.ru, the Internet site of Russian state broadcasting body VGTRK, picked up on the amusingly quirky story of Sammy Maalem, a Cardiff jeweller who can't find a decent man. Vox Pop: Death penalty in Russia? The loveless 27 year old hit the headlines when her brother took matters into his own hands and advertised the attractive blue-eyed brunette on eBay. Vesti, perhaps too well versed in the Russian notion of brides for sale, put a bit of spin on the story in a headline declaring: "Briton put his sister on an Internet auction site to find her a husband." Unlike sites for Russian mail order brides, which according to a recent detailed study of similar Ukrainian sites by The Guardian's Moscow correspondent Shaun Walker, are often thinly disguised machines designed to milk potential foreign suitors of streams of cash, Sammy's advert was modest. Vesti.ru reported that her photos on the site were "accompanied by a colourful description" although sad might be a more appropriate word. Describing the goods as "used" (a detail Vesti.ru overlooked, although it did note that Ms Maalem was furious, but then decided to "seize the opportunity") the advert revealed that though "lively and sociable" a series of "immature" boyfriends had either cheated on or dumped her. Perhaps there was something in Vesti's last comment that smacked of grim satisfaction that it is not only Russian girls who are forced to advertise for a decent man, when it concluded: "Whether the auction advert was successful went unreported. Whether Sammy met with a winner is unknown." Taking a gamble on an Internet site seeking money for love may carry unpredictable odds. After reporting the recent case of Alan Knight, a British man who feigned total paralysis in order to avoid a court case for swindling his neighbour out of £40,000, Moskovsky Komsomolets, related an older story of fraud, commenting laconically, "However, in Britain there are people, no less resourceful than Alan Knight." When Danielle Watson, a 24 year old Colchester woman, realised she needed money for an expensive wedding she hit upon the idea of claiming she had an advanced type of cervical cancer. Hundreds of well-wishers dug deep into their pockets to pay for the young woman's expensive nuptials. Weeks after the wedding she announced to astonished benefactors via a social media site that she was miraculously cured and pregnant to boot. The police were called and a judge, who found her guilty of fraud at a subsequent court case, warned her that despite having already become a mother, she could face a prison sentence. The one tiny detail found in the original British reports that MK missed was that the scheming Mrs Watson had once worked as a PA at Britain's Financial Services Authority. Perhaps she learned a thing or too there and it's surprising that MK, as tabloid as they come, didn't capitalise on such a juicy tidbit.